WANT TO LOSE WEIGHT & KEEP IT OFF? Find out how thousands of patients have acheived long term success. It’s a fact: If your metabolism is out of balance, losing weight and keeping it off is impossible. So what do you do? Have a physician fix your metabolism first. 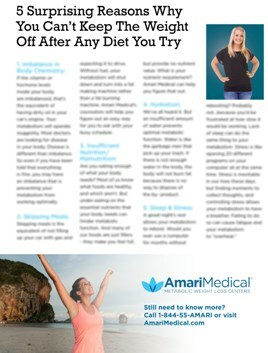 That’s what makes Amari Medical different from every diet program you’ve ever tried. How well is your metabolism functioning? Find out for today. 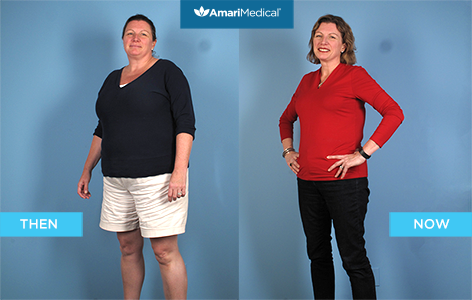 We test your metabolism at your consultation and work with you to create an action plan. We begin a personalized nutrition program to maintain health and lose weight. You buy your groceries, cook meals in your kitchen. Eat, fresh, grocery store foods. Always feel full & energetic! Not just a weight change. You change the way your body works. Learn how to lose weight, and how you can keep it off!